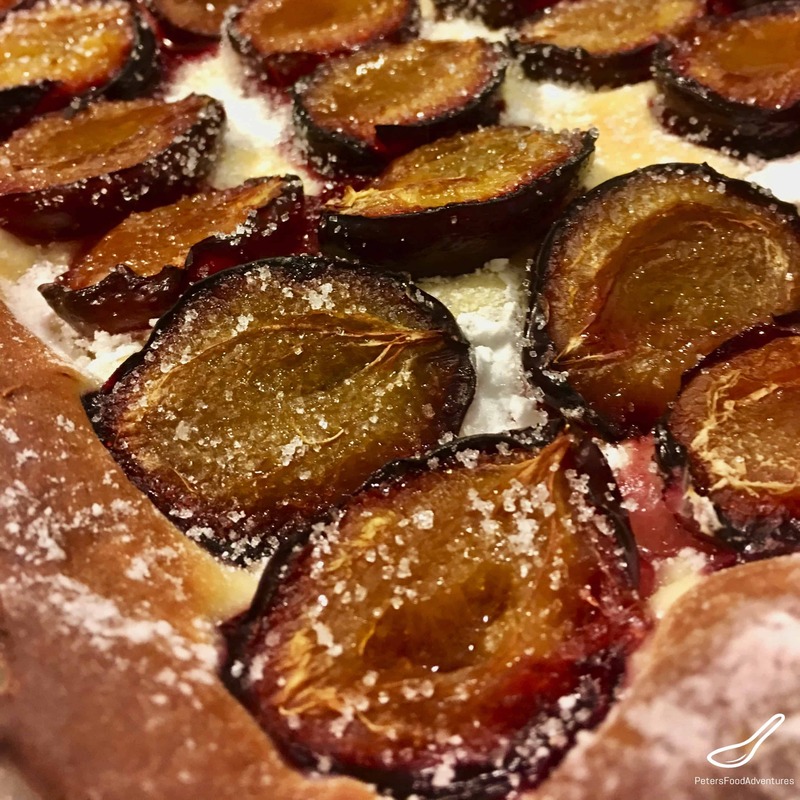 This Plum Tart was a rustic favorite that mum would bake every year. I believe this recipe is of German origin. We had 2 purple Italian Prune Plums trees that gave us plenty of fruit each year. Mum would bake this Plum Pie on a large baking sheet, and cut into squares when serving. She’d also put some in the freezer as it freezes well. Maybe it’s more of a Plum Pie instead of a Plum Tart, but in Russian it translates as a pie. I always poured some whipping cream on my plum pie, but whipped cream or ice cream works well too. You either love plums or not, some people think they are too tart, but they are perfect in an open faced plum pie. The sugar is sprinkled on the pie when it’s done baking, as the sugar will burn if you do so before you put it in the oven. You can use Vanillin Sugar, which is popular in Russia, instead of white sugar. As there is some vanilla in the dough, I usually just use regular sugar. This recipe uses a bread maker to make the sweet yeast dough. It’s so simple to throw in all the ingredients, set on dough cycle, and it mixes and raises the yeast dough for you. Minimal mess and an easy way that you can’t screw up. All that’s left is to roll out the dough. The dough will be stick and soft, I usually use about half a cup of flour on the table to lightly knead it and to prevent it from sticking to the table. The purple Italian Prune Plums are best for this recipe as they are smaller in size and delicious. The riper and juicier the plum, the tastier it will be. Don’t use hard unripe plums. If you only have large red plums, then you might need to cut them into smaller pieces. Either way, this recipe is sweet and delicious, a rustic way to enjoy Russian sweet dough called sdobnoye (сдобное тесто). Bon Appetit! Приятного аппетита! 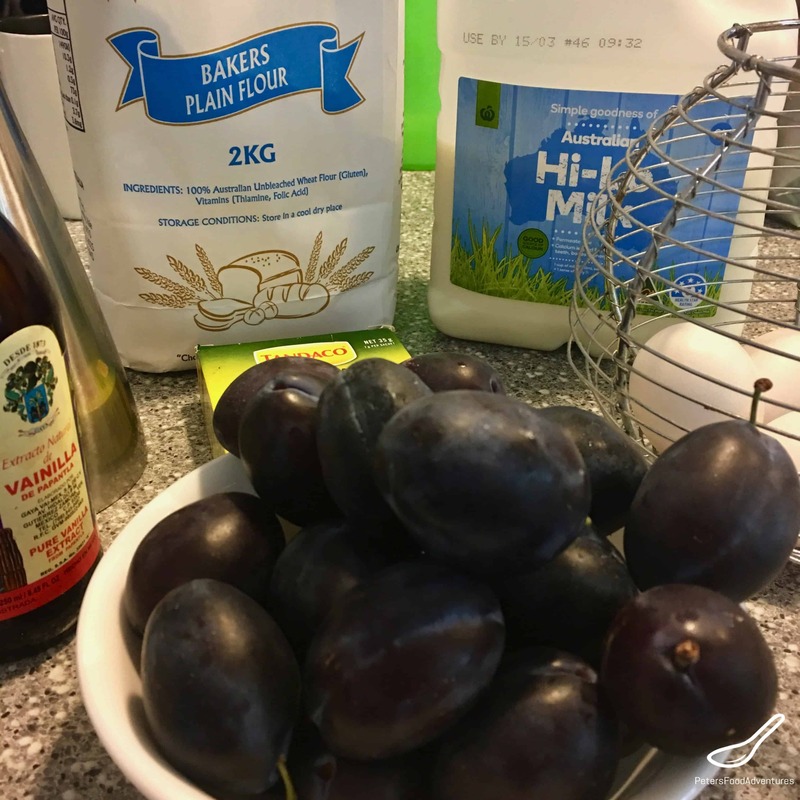 Place ingredients in the order listed (minus potato starch, plums and sprinkling sugar) into your bread machine and select the dough program. When the dough is ready, roll out the dough on a lightly floured surface, into the shape of the baking tray. Roll it out to about ½ cm thick, or ¼ inch thick and place on top of the parchment. Lightly sprinkle the dough with potato starch before your place the plums. Best to use a sieve for even spreading. This will help soak up the juices as it cooks, and the dough won't seem unbaked. Split the plums in half, remove the seed, and place the plums side by side covering the dough (split side facing up). 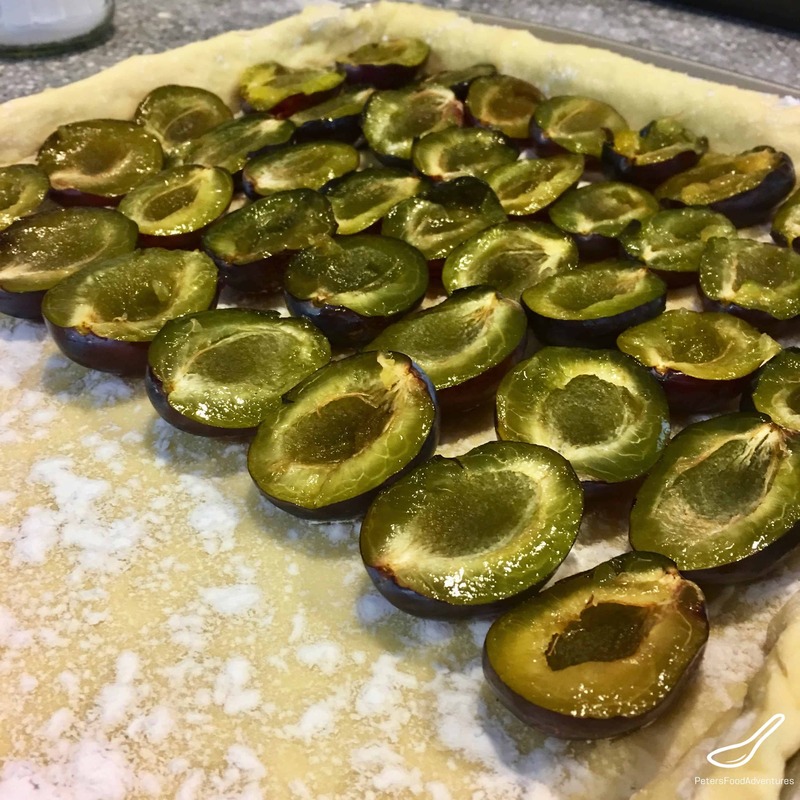 The dough should be covered as much as possible with the plums. Place in the the oven for about 20 minutes until the dough starts to turn golden brown. To keep the sides of the dough from burning, cover with foil and return to over for another 20 minutes. Check that the base of the pie is cooked underneath and that the fruit is soft and juices start to release. If needed, keep in oven and keep checking until you are happy with it. Mine took around 50 minutes. Remove from the oven and generously sprinkle sugar on top of the plum pie. Serve with whipping cream or ice cream. How rustic and how beautiful! Thanks Jeff! It’s one of those childhood food memories for me. ???? You have a great blog, Peter. It’s very well done, designed, with some great recipes. I lived in Moscow in 70’s, studying at VGIK. Since then, I had to make my pelmeni, sci, borsch and pierogi, from time to time, but my borsch never tasted “right,” until I’ve read your comments. So I tried again to do it your way. Well, that’s it. Exactly. Wow, thanks so much for the compliments, and for giving the recipe a try. VGIK sounds very exciting, oldest film school in the world! I’ve bet you’ve got some great stories to tell with that experience! Thanks again for the great feedback!